‘Heavy Mental’ psych rockers BLAAK HEAT SHUJAA will release The Storm Generation, their debut EP for Tee Pee Records on December 18. On The Storm Generation, thick, colorful bass lines coexist with flying reverb guitars, ethereal chants and loud, tribal drums. Produced by Scott Reeder (Kyuss, The Obsessed) in the Mojave desert, the EP features a guest appearance by Nobel Prize-nominated gonzo poet Ron Whitehead, adding even more color to BLAAK HEAT‘s signature psychedelia. The EP is a precursor to the band’s new full length The Edge of an Era, which is set for a March 26, 2013 release. BLAAK HEAT SHUJAA‘s enticing blend of genres has been called “a dissonant symphony unveiling visions of great natural expanses” and is unlike anything you’ve likely heard before. The band’s transcendental tension between its heavy rock roots and an organic inclination to drift towards psychedelia pays homage to the vast collection of mind-expanding sounds the trio grew up on: neo-psychedelia, surf rock, spaghetti westerns, Middle Eastern scales and Far Eastern melodies! Formed in 2008 in Paris, France, BLAAK HEAT SHUJAA promptly established itself as the ‘young Turks’ of European heavy psychedelia and boast a cinematic sound that has been called “Heavy Spaghedelia” featuring “psychedelic, meditative, trance-inducing” and “spacey atmospheres”. 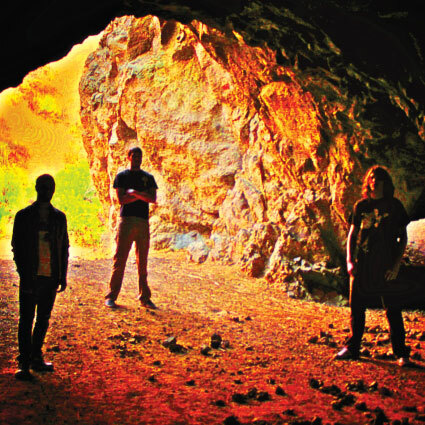 Now based in Los Angeles, the trio’s music has evolved into a hybrid of styles that is sure to find appeal to fans of Earthless, Kyuss, Naam, OM and Calexico! BLAAK HEAT SHUJAA is: Thomas Bellier (guitars, vocals), Mike Amster (drums) and Antoine Morel-Vulliez (bass).